In every collective conscious experience, there is a print left on the human psyche so that everyone is feeling that thing in a familiar way. Some will say that they can’t put a name to it until another experience comes to clarify what occurred. A light bulb goes on and one is left wondering, “Why didn’t I think of that?” The very talented performers of the youth ensemble of Free Street Theater have provided a brilliant exposure of Abraham Lincoln with Abe’s in a Bad Way. This production is called a string musical installation and stretches the boundaries of what is called theater. One is spellbound experiencing the performers’ revelation of Abraham Lincoln’s last days – done with impeccable timing and flashes of dark humor. The action starts with a vignette from the play Our American Cousin, which was playing at the Ford Theater on that fateful night. It is a funny enactment of what was most definitely mediocre 19th-century theater. When the shot rings out, the scene is set for the an entire country in the state of shock. The sound of the Long String instruments, a guitar, and box/block percussion provide a stirring dirge-like atmosphere. A doctor appears downstage to add a leit motif of dialogue, detailing the President’s last hours. It is factual and yet haunting to hear what is discovered to be the actual medical transcription of Lincoln’s heart rate, respiration, and pulse. 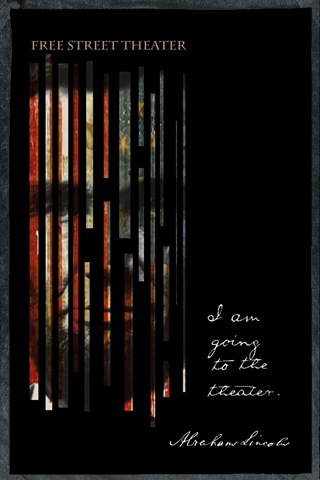 There are projections upstage that show Lincoln’s personal life as well as the history of his days in office. We see through these images not only a country dealing with grief and sadness over the assassination, but also the grief and mourning of his family. Ultimately it is shown that Lincoln dealt with through constant grief and depression all while governing a nation divided. His marriage to Mary Todd was seen as a sudden decision and their union was fraught with tragedy and division. 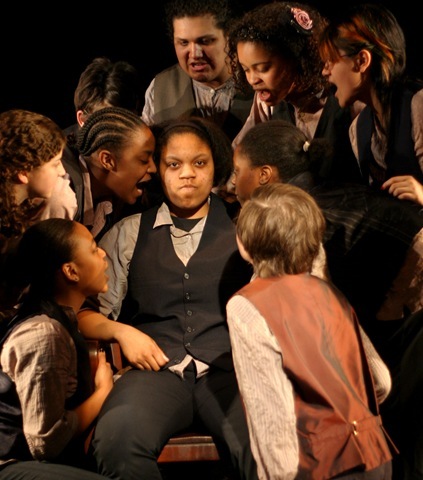 The show’s depiction of the stages of depression and anger is a very intense experience. A player sits in the iconic pose of the Lincoln Memorial in a rail back chair while being berated with a twisted ‘this is your life Abe’ tirade. There is a young woman sitting at the foot of the President who taunts Lincoln (Amber Smith) with the details of his sudden marriage and children’s deaths. Then there is what was perceived to be his political failures recited as a bitter litany. His failure to be elected senator and a hard fought national election of which the result was immediate secession by Southern states and the Civil War. The sepia toned daguerreotypes on the screen behind project pictures of his children, along with images from Civil War battles, piles of bodies stacked into piles, make the era seem more current than ages ago. Another wonderful scene involves the ghost of Lincoln’s son Willie, standing in front of his gravestone, comforting his father with talk about heaven. A haunting tune is sung in the background as Willie tells the dying president that being dead is easy. As the doctor pronounces Lincoln dead, the ensemble takes the stage and echoes the dying breath in relief and acceptance to an adaptation of Walt Whitman’s “O Captain” set to music. The performances of these young people are professional and on a par with the most stringently trained Method actors. At a post show talk about their creative process, it suddenly occurred to me that these were teenagers. The crackling energy and excitement of being on stage was running through the room. 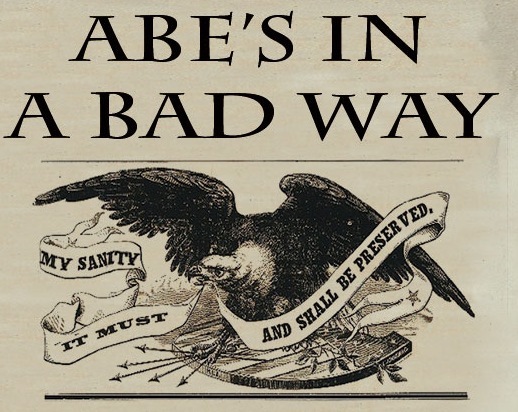 They explained how they created Abe’s in a Bad Way. This is a product of extensive research on depression and the details that made up the life of Lincoln and his family. Also explained were some of the nuts and bolts of blocking on stage, and the stream of consciousness and improvisation that went into creating the dialogue and physical movement for the different stages of grief. Also present were Director Anita Evans and Musical Director Stone to answer questions or elaborate on the process of creating this production. Stone’s musical resume includes performance with String Theory Productions. The instruments sat on a coffin base and an antique trunk surrounded by American flag bunting. They look liked deconstructed pianos, a ghostly blend of harmonica, violin, zither, and percussion. Ms. Evans seemed to have a disciplined yet very respectful approach to working with these young actors, which definitely shines through in the finished product. This is not cute children’s theatre – the future is now with these performers and I expect that we will be hearing from them again and again. In fact, some of the company is traveling to Thailand to create a production with Makhampon Theater in Chiang Dao, Thailand. The performers are as follows: Chance Damon, River Damon, Danielle Davis, Sophia de Oliveria, Summer Edmonds, Giovanni Gonzalez, Karina Gonzalez, Arden Harris, Linda Millan, Nemeh Morrar, Amber Smith, and Brittany Ward. The talented ensemble also wrote the play with assistance from Director Evans and excerpts from writings about Abraham Lincoln. I encourage you to see this production. Free Street Theater is celebrating its 40th anniversary this year – 40 years of nationally-acclaimed productions and some very gifted performers. I was a day camp kid on a field trip to Ravinia in 1970 when I first saw Free Street. I had seen big productions in the Loop and still I thought Free Street was the coolest thing running. I had the same feeling some 40 (what??!) years later. 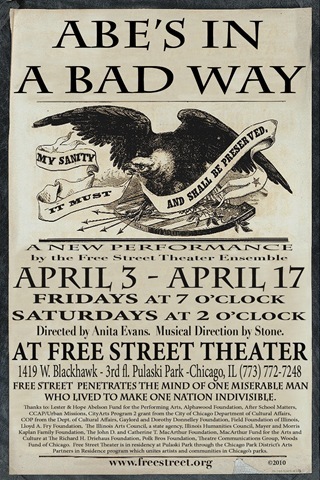 Free Street Theater penetrates the mind of one miserable man who lived to make one nation indivisible.